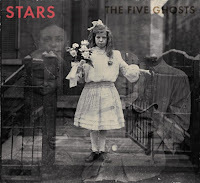 Atlas and the Anchor: Stars - "The Five Ghosts"
Stars returned last week with The Five Ghosts, their fifth album and first on their own record label, Soft Revolution Records. The new album remains true to their signature theatrical style but this time they move in a more compact, gloomy and gauzey synth-heavy direction. “Dead Hearts” opens the album with a question and answer/call and response verse between Torquil and Amy before they join together on the chorus over a hauntingly dreamy soundscape. “Wasted Daylight” features a muffled Postal Service-like beat and a bright, catchy chorus sung by Amy. “I Died So I Could Haunt You” stands out, sounding like a synth-driven Smiths as they trade vocal duties with twinkling keys and a driving guitar riff. The first single, “Fixed” is effervescent with steady keys and lilting vocals. “We Don’t Want Your Body” is made for the dance floor with squelching synths and a thick beat as Amy makes like a pop star with a chorus that if auto-tuned would be all over the radio. And if that song is the party, the next song, “He Dreams He’s Awake” plays like the morning after with a soft and solemn slow churn. Other standout tracks are “Changes” with its girl-group melodies and soaring strings provided by The Secret Strings and the bouncy “The Passenger” with its infectious synth line during the chorus that is just as catchy as the vocal melody. And “Winter Bones” is a plodding, dramatic album closer, hewn to the hem of their signature style. The Five Ghosts may not be as embellished and grandiose as we have come to expect from the band but the hooks are sharp and their lyrical themes of love and death, and the death of love are more than enough.